Every day, the drums bang, the cymbals clang, and a stream of men in traditional Korean outfits carrying swords and wearing helmets march outside Deoksugung Palace — where King Gojong, a noted coffee addict, first brought the brew to prominence in South Korea in the 1890s. This elaborate ceremony takes place in front of a landmark more familiar to American eyes — the pink and orange neon sign of a Dunkin’ Donuts. Readers may recall (R)D’s earlier account of the contest between Starbucks and Dunkin’ Donuts for hegemony in the U.S. And readers will know that both brewers are angling to dominate the global market as well. While China is the headline market up for grabs– Starbucks currently has more outlets there; DD arguably has more creative market customization— Korea has turned into a battleground as well. 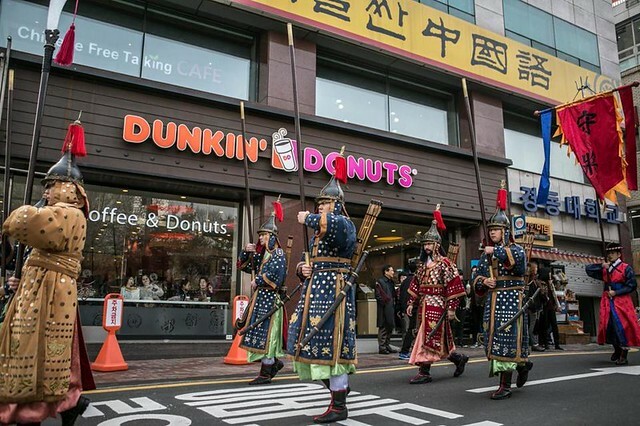 South Korea now boasts more than 900 Dunkin’ Donuts outlets, nearly as many as there are in the chain’s home state, making it the company’s largest international market. Starbucks is 300 stores behind. Starbucks was the first to open in South Korea, in 1999, and it immediately shook up the marketplace. Koreans had a taste for coffee — during the Korean War in the 1950s, US soldiers brought packets of instant coffee and shared them with Koreans — but there were few Western-style coffeehouses. Teahouses dominated the culture, and they were often dark, smoke-filled, and sometimes involved prostitution. Starbucks offered a brightly lit experience, some cultural cachet, and expensive coffee. “At Starbucks, Koreans jumped on the bandwagon,” said Daniel Schwekendiek, an economics professor at Sungkyunkwan University in Seoul who is writing a book on Korean consumption culture. “It was considered a place to be. It’s a status symbol. Students spend $5 or $6 for lunch. And $5 or $6 for coffee.’’ Dunkin’ had officially opened five years earlier but was more focused on selling doughnuts than promoting its coffee. Not long after Starbucks emerged, Dunkin’ recalibrated its strategy, launchinga three-year advertising campaign emphasizing “two hands,” one holding a doughnut, the other holding coffee. Even in the annals of a half century of American fast food companies pushing overseas growth, the Dunkin’ presence is notable: There are three times more Dunkin’ Donuts outlets in South Korea than there are McDonald’s. As we put the caff back in the half-caff, we might recall that it was on this date in 2007 that Iran intensified it’s crack-down on “bad-hajib,” un-Islamic grooming and clothing. 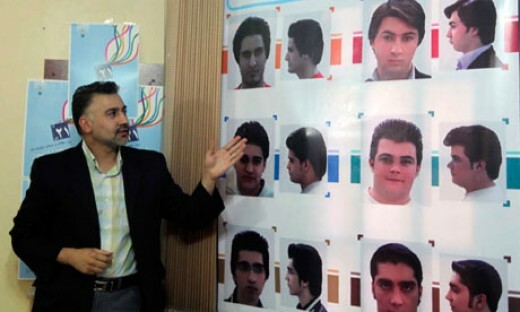 Earlier, Iranian police had warned barbers against giving men Western-style haircuts or using make-up of any sort. It was on this date that Iranian television announced that the crackdown had started its next phase, in which mobile police units would patrol Tehran in search of those who did not observe Islamic dress sense. As part of the warning, Tehran’s public prosecutor suggested that women who violate dress rules should be exiled from the capital, and forced to live in remote areas of the country. « “For what do we live, but to make sport for our neighbors, and laugh at them in our turn?”….